Violet Jean Horvath (DeSantis), 91, passed away peacefully, Monday, September 10, 2018. She was born on December 23, 1926, was a lifelong resident of Lorain, Ohio and graduated from Lorain High School class of 1945-B. Along with her late husband, Ernie, Violet owned and operated Horvath’s Grocery and Meat Market in Lorain as well as Kreem King and Super Creem custard stands. She was also the manager of Lane Bryant Midway Mall for ten years followed by a number of jobs at Lorain City Schools including Library Aide, Teacher Aide, and finally head Receptionist at the Board of Education offices where she retired at 83 years of age. 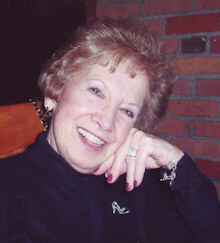 She and her husband were members of the Cosmopolitan Dance Club and she was a long time member of Lakeland Women’s Club, Zonta, and Friends of the Lorain Public Library. Vi was always full of life and love. She loved her family above all else and was a wonderful mother, perfect grandmother, and doting great-grandmother. She was thrilled to have a house full of family, laughter, music, and food and was an amazing Italian cook. She loved all things fashion and shoes, was an avid reader, devoted “Jeopardy!” fan, and collector of Limoges and porcelain shoes. Violet is survived by her loving family: daughter Linda (Alan) Irwin of North Ridgeville, grandson Mark (Brittany) Irwin of North Ridgeville, granddaughter Jennifer (Brian) Slife of Avon, great-grandchildren Anthony and Harrison Irwin and Stella Slife, sister Eva Costin, and sister-in-law Helen DeSantis. Violet was preceded in death by her husband Ernest, son Daniel, parents Antonia and Dominic DeSantis, siblings Ann Brunotts, Lena Sposato, Mickey Kosanovich, and Pete DeSantis. Friends may call on Monday, September 17 from 5:00 – 8:00 p.m. in the Gluvna-Shimo-Hromada Funeral Chapel, 3224 Broadway, Lorain. Funeral Mass will be Tuesday, September 18 at 10:00 a.m. in the Catholic Church of St. Peter, 3501 Oberlin Ave., Lorain. The family requests all mourners to meet at the church. The Rev. Craig Hovanec, Pastor of St. Peter Parish, will officiate. Burial will follow in Ridge Hill Memorial Park, Amherst Township. The Fatty acid Oxidation Disorders (FOD) Family Support Group with designation to Clinical Trust Fund or Research Trust Fund.